Pirates of the Caribbean: The Curse of the Black Pearl is a great movie with a soundtrack to match. A 18th-century adventure tale, the premise is Captain Barbarossa (Geoffrey Rush), and his ship The Black Pearl crewed by the undead, sack the town of Port Royal and kidnap the Governor’s daughter, Elizabeth Swan (Keira Knightley), whose blood they believe will unlock the Aztec curse that damned them. But they are pursued by the perpetually goofy Captain Jack Sparrow (Johnny Depp) and the serious, straight-edge childhood friend of Elizabeth, William Turner (Orlando Bloom). This eccentric plot of swashbuckling pirates, ancient curses, and the undead gives us a movie that is both serious and light-hearted at the same time. The stakes are high and the action is thrilling, but the film never takes itself too seriously. In fact, it’s this interplay between the historical and the fantastical, the light and the serious, that makes the film and the soundtrack work so well. Now I realize there is some controversy regarding Hans Zimmer and Klaus Badelt borrowing themes for the Pirates soundtrack from other movies like Gladiator, but I’m not going to get into that. I think this soundtrack is well-executed and fits the film, and I’m going to take an in-depth look at why. I chose the third track of the Pirates’ soundtrack, The Black Pearl, because I think it demonstrates this interplay clearer than any of the others. It has many of the film’s themes crammed into a single track, which makes it easy for us to analyze the different themes and see why they fit together. Last thing before we start, I recommend downloading my transcribed score as a PDF and following along using that, as I omit some bars here. As you can see the track jumps right in, smashing on a tritone in the low strings and brass. This is a dissonant interval that lets us know right away that this track has a darker atmosphere. As you can see from the graphic above, the octatonic scale consists of eight notes instead of the 7 that make up major/minor scales, and it alters between half steps and whole steps or vice versa. A closer look reveals that the scale consists of two diminished seventh chords a half step apart. Because diminished chords are the most unstable chord, this gives the scale a fundamentally dissonant sound which is perfectly suited for the dark atmosphere the track opened with. At this point the music starts to build, growing in volume and accelerating in tempo. It still has a darker, minor sound, using the first 3 notes of the D half-whole scale D, E♭, and F. So we’re still using a similar pitch selection but in a way that sounds like we’re moving somewhere. Bars 17-19 increase the buildup even more. In measure 17 we hit an A pedal in the bass with a D-minor chord above it, which is a classic way to delay a V-I progression. The rapid D-minor triplet figure above it in the high strings and brass gives us even more of a sense of direction. If you look in the middle strings there’s a line that rises from D4 in bar 17 to B♮ and C♯ in bar 19. This is a clear melodic minor figure that, by the time the C♯ arrives above the A pedal at the end of bar 19, completes the A chord (V) and sets up the return to D minor in the next bar. Rather than just banging away at the rhythmic chords, this introduces a nice melodic figure that helps to connect the D minor chord in bar 17 to the A chord in bar 19. Oh yeah! Now it’s starting to sound like Pirates of the Caribbean. This is a fun, dance-like tune that fits the pirate theme well. It’s the first bit of contrast to the darker atmosphere earlier in the piece, and is a direct reflection of the light versus dark duality that’s constantly reappearing throughout the film and the soundtrack. I think it’s also worth pointing out the simplicity of this section. The harmony is simple: i v VII iv i/v v progression (note the minor v), and so is the catchy little tune that plays on top of it. Yet, together they go a long way towards reinforcing the theme of the film. Simple, well-crafted music goes a long way. Another technique to make note of is the doubling of the tune an octave above at bar 24. This is a good way to alter the texture of a line by reinforcing it an octave above, giving it more weight but also brightening it. The inverse, of course, is to double an octave below and darken the texture, which is an equally interesting effect. This doubling technique is used throughout the track. 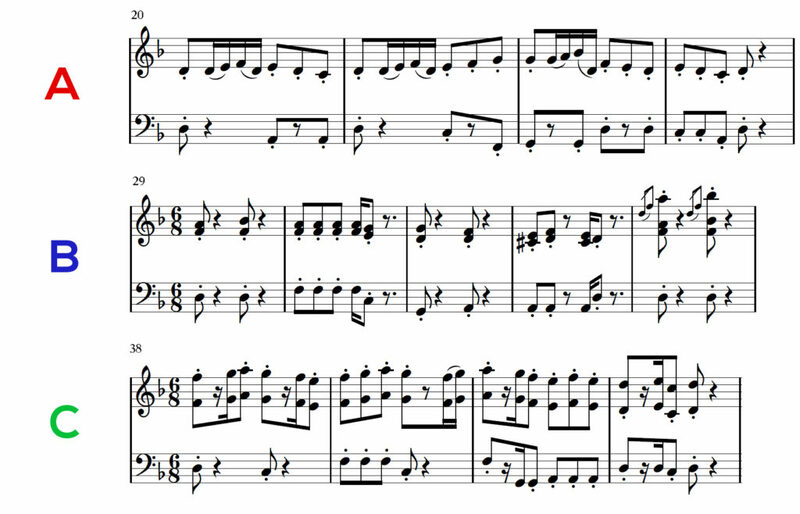 Another fun Pirates of the Carribean theme that feels like a completion of the previous tune. It still has the fun, dance-like feeling, but is a little more tonally ambiguous! The harmony is: i VI III VII iv i/V V i. Yes, unlike the previous theme we have a perfect authentic cadence with the major V instead of the minor v, but take a look at how many major chords there are in that progression. There’s the VI, III, VII, and V compared to two minor chords iv and i.Technically we’re in D minor, but with that many major chords it’s honestly hard to tell. This major/minor ambiguity gives us arguably the biggest contrast of the piece, going away from the dark diminished scales of the beginning to a bunch of major consonances, once again reflecting the ever-present contrast in the film. At measure 35 we have a really interesting transition with an ascending line in the upper strings against a descending line in the lower strings, accentuated rhythmically with sixteenth notes. The upper line is almost chromatic, moving from the III to the V, and that along with rhythm gives it a strong sense of momentum leading into the next theme at measure 38. Bar 38 gives is another trademark Pirates of the Caribbean theme, albeit a short snippet of it. The tune is another variation of the tune from bars 29-34 over a i VII III VII iv V i VII i progression. Once we hit measure 42, things are winding down. The section begins with a melodic D minor line in the low strings before changing into a pulse-like rhythm in measure 46. 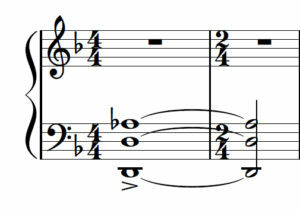 The A♭-D tritone from the opening two bars of the track returns as well. Eventually the pulse starts to break down, getting smaller and smaller until ending the piece in bar 62 with a single hit of an eighth note. I mentioned earlier that I think the themes from this work well together. I think this is a fundamental question that all composers wrestle with. When writing for a piece, how do we know when ideas are related? How can we identify that they either fit well together or that they don’t? This is a difficult question to answer and, to be honest, there’s no real answer. In fact, sometimes your ideas don’t have to be variations of one another at all—putting unrelated ideas together in the same piece can be just as dramatically effective as related ideas. This is even on display in The Black Pearl with the contrast between the darker diminished sections contrasted against the more consonant melodic sections. Assuming we want related ideas, however, there are a few primary things we can look at to help us identify related ideas. So, what are the similarities? All of them are in 6/8 and share the same pulse, accenting the downbeats: 1-2-3 4-5-6. With Theme A, the sixteenth note figure rushes towards beat 4, giving it a stronger accent when it arrives. Likewise with Theme C, although the sixteenth note figure rushes towards beat 1. Theme B directly accents the downbeats with a staccato eighth note on beats 1 and 4. They share the same harmonic rhythm. Harmonic rhythm is the perceived tempo at which the chords change, and we can see that the chords change every downbeat for each theme. They share the same 4-bar phrasing. Even though Themes A and B play for 8 total bars, each phrase only consists of 4 bars just like with Theme C, simply giving us two phrases instead of one. Theme B feels like a completion of Theme A. Theme A is a constantly moving line alternating from eighth to sixteenth notes while still accenting downbeats, giving only a single quarter note of rest at the end of the phrase. Also, it has a climax on beat 3 with the B♭, the highest note in the line. Then Theme B comes right after it and moves much less, with staccato accents on beats 1 and 4, and places the climax in the first bar on beat 4. In other words, Theme A waits to give you the climax, and when it does it’s a very quick, unaccented sixteenth note, whereas with Theme B it brings it to the forefront as if confirming the climax of Theme A. I think it’s this trick, the contrast of rhythm, the shared climax, and the placement of the climaxes within the two themes that creates this sense of completion. There’s a lot of interesting stuff in this piece of music that you can use in your own compositions, from octatonic scales to octave doublings, and while this article only scratches the surface, hopefully it provides something useful!